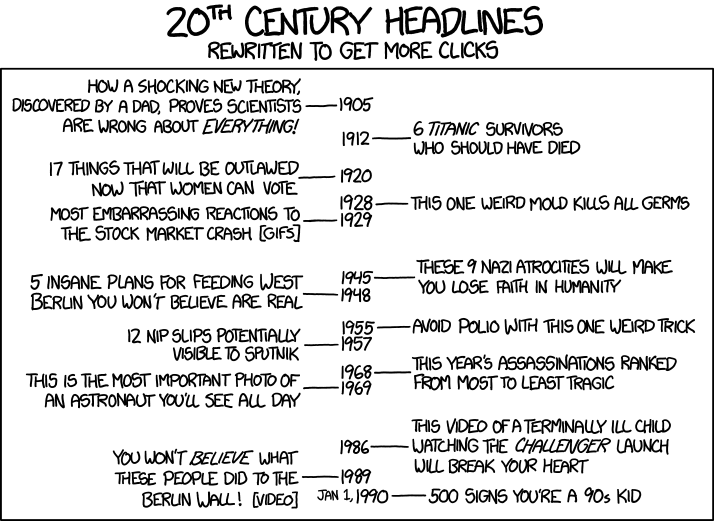 “Clickbait” headlines…whether or not you’ve heard of the term, you’ve definitely fallen for them like the rest of us. Over the last couple years, clickbait stories have kind of gotten a sleazy rap because readers often feel duped after clicking on a story that didn’t deliver. Fortunately though, we have funny writers like Randall Munroe at XKCD who can combine humor, history, and clickbait copywriting into something pretty cool. Haha, right?! I would love to see other clickbait headlines for different centuries.